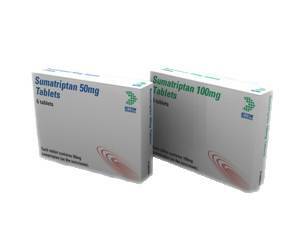 Sumatriptan is a painkiller that is specifically used for migraine attacks. It is thought that widening of blood vessels in the brain causes the throbbing pain of migraine headaches. The active ingredient sumatriptan relieves pain by causing the blood vessels in the brain to narrow. Sumatriptan is a prescription-only medicine. Triptans such as Sumatriptan are used to treat migraine headaches. Migraine is a type of headache that involves severe, often pounding pain, usually to one side of the head, nausea and sensitivity to light and sound. The onset of a migraine may be preceded by an aura: visual disturbances such as flashing lights, stars, distorted colours or zigzag patterns. Migraine episodes can last a few hours up to several days. Sumatriptan should be taken as early as possible after the migraine headache has started, though it is also effective if taken at a later stage during the migraine attack. It is not effective in preventing a migraine headache from occurring. Sumatriptan tablets should not be chewed but swallowed whole with some water. They usually provide significant relief within 30 minutes. If the first dose of this medicine does not relieve your migraine headache then you should not take another dose for the same attack, as trials have shown that this is not effective. If your first dose does initially relieve your migraine, but the headache then comes back, you can take a second dose. Adults aged 18 to 65 years: one 50-mg or 100-mg tablet at a time. Repeat if necessary. Do not take more than 300 mg in any 24 hour period. Always follow the prescription exactly – never take more than the doctor recommends. Sumatriptan tablets are not recommended in people under 18 and over 65 years of age. Read the package leaflet before use. For a complete list of side effects, see the package leaflet. Consult a doctor on the use of Sumatriptan if you have a health condition that is not listed above, are taking medication, smoke cigarettes or are older than 40 years of age. Sumatriptan should not be used by pregnant or breastfeeding women without consulting a doctor first. This medicine may cause dizziness or weakness. Stay out of traffic if you experience these side effects. Alcohol is a migraine trigger. Avoid drinking alcohol shortly after a migraine attack.